Loaded with features you and your baby will enjoy, the aluminum-framed Cortina Stroller from Chicco® features a one-hand fold, 5-point harness, height-adjustable handle, parent and child trays with cupholders, and an adjustable, removable canopy that is also water-repellant. The multi-position, fully-reclining seat and adjustable leg rest provides comfort for your baby. The seat has memory recline for your convenience; it remembers the position you last left it in before folding. The large basket is accessible when the stroller is fully reclined. Linked rear brakes and all wheel suspension provide an extra-smooth ride. This stroller can also be used as a travel system with the Chicco® KeyFit™ or KeyFit™ 30 infant car seats (sold separately). We just bought this stroller over the weekend, and I love it! The basket is large and easy to get things in and out of, the seat lays completely flat and it is very easy to close one handed. A great product! Love love love this stroller…this is my second baby, so I knew exactly what I wanted. This has all of the features I was looking for and more, plus my 4 year old can fit in it. It goes to 50lbs. This is awesome! Great buy! Awesome stroller. I’m a small woman and I have no problem lifting this stroller in and out of the trunk of my small sedan that it fits in perfectly. Before purchasing this stroller, my infant would scream every time I put her in the stroller. When we tried this one out she just laughed and cooed and almost always falls asleep in it. I love the ease of folding the stroller up to put in the car or just to put it away. I loved the fact the stroller weight limit went to 50 pounds. So I can get a great amout of use out of it. My 3 year old daughter loves it. I just bought this stroller (my 6th in 4 years) and am very pleased thus far. When we were looking my husband brought it over to me and I thought it was going to be much more expensive than it was! This is quality Italian construction and styling without the $$$. It was really easy to put together also, always a plus. ~It has a big, roomy seat and tall hood, our 3.5 year old was comfortable in it as was our 1 year old. ~The fabric is easy to wipe down and CAN BE removed to hand wash.
~It is a full size stroller that is lightweight. This is a great stroller! This product was mentioned to me by a dear friend. I had never heard of Chicco before and am extremely happy with this stroller. Very easy to put together, and has many items that make life easy. Great features, very sturdy. Easy fold up and opening. Very comfortable to walk behind. Wife likes the adjustable grip handle. Very good product! I wish they had this out for my first born. NOw shopping for a carrage for my 3rd baby, I love this carrage!! Everything you really need in a stroller. Can accomodate an infant through the toddlers years. Roomy seat that reclines flat,big basket, opens and closes easy. Its great!! Great value. Better then any PegPerego out there. I bought this stroller with the car seat. I am 110% satisfied with my choice. I have 3 kids and am always going to the park and baseball fields. I needed a stroller that was able to handle going over grass and rough areas. I got it. The handle adjusts for my tall husband (so his back doesn’t break) and lowers for my 5yr old to enjoy pushing his sister now and then. The 1 hand fold and open is so convienent for me as well. I recommend this to all who need a sturdy yet functional stroller! We switched to this stroller after having trouble with our aria peg perego. Although this is heavier and a bit cumbersome…the comfort, ease, and compartments it offers beats the cons. Pushing this stroller is such a breeze. I used to break my wrist trying to turn the wheels of our peg perego. The basket is awesome. It fits my diaper bag and a whole lot more; the parent tray if perfect; the seat reclines almost flat; very sturdy. The Greatest Stroller in the whole wide world!!! !Its pros are-(the biggest one) FULLY reclining back-fits carseats nicely-child’s tray is dishwasher safe-the belts are adjustable-the easy access of the basket (and it’s pretty big too! )-useful parent’s tray-one hand folding and unfoldingIt was the best stroller in the whole […] store!!!!!!!!!!!!!!!!!!!!!!!!! !Buy, buy, buy!!!!!!!!!!!!!!! We purchased this stroller to go with the Keyfit 30 carseat and I couldn’t be happier. I really love the 5 point harness, and the fully reclining back. You still have good access to the basket when the seat is reclined too. Its a cinch to fold up, and isn’t too heavy for me to lift. The cupholders are an added bonus! Its really sturdy, and easy to assemble! i love this stroller.my son was 2 months old when I got it.He hates to be pushed around in a travel system, so I had to buy the stroller. I stopped a couple of mom in […] who had this stroller and asked them about it. I liked what they had to say so I bought one.I love it but its a bit on the heavy side. And the back folds up a bit when you lay it flat for the baby to lay down in it. My son doesn’t fit in the stroller when it’s all the way down because the back part ‘lips’ up. When you see it you will know what I mean.Other than that, I do love the stroller. This is, by far, the best stroller I have found. The best feature, in my opinion, is that it lies totally flat. It is a bit heavy at 23 pounds, but it is much lighter than the other strollers I saw that reclined completely. Material is high quality, it’s very sturdy, and it folds in/out very easily. I highly recommend this! Well I have had quite the shopping experience. Spent my lunch hour playing with strollers since I went with one I wanted in mind and left with another when I noticed the basket on the one I was going to get sucked!! Anyway I love this stroller, the basket is a plus and you dont kick the wheels it is sturdy and well what can I say.. I bought this and took my graco metrolite one out of the car and put it away to sell, this one is a little heavier and bulky BUT so much more comfy for kids!! I had been looking for a stroller to replace my Peg Perego that I HATED! I had looked at Graco Quattros and this one. I kept going back to this one, it is lighter than the Graco and the seat seems more comfy for my little princess. I love how when you fold it up, it stands only on it’s wheels. None of it has to touch the ground except the wheels if you don’t want it too. It is super easy to fold, steer (even one handed) and put in the back of the trunk. I love how it is a full size stroller yet doesn’t have the weight as a full size stoller! Great basket, fits a TON of groceries in it! I can’t say enough good things about this stroller, now I find stuff to do to be able to go and use it! SO far I LOVE this stroller. It was so easy to put together and is very sturdy. My husband is 6’4′ and the handles are perfect for him. I am 5’4′ and Like the height as well. It is a bit heavy for me, but, I am still pregnant so that might be why. So glad that I read reviews and bought based on them. I never saw this in the store, bought online only, and NOT regretting it!! I researched several strollers online and in-person before I chose this one. The others couldn’t even measure up to what this one offered! The best feature, is the fully reclining seat. It also has the extra side head padding allowing a nice spot to lay a sleepy head. The padding is very comfy and the seat lays totally flat with access to the basket below. The foot rest can fold up to create a bassinet of sorts for the smaller babies. It’s such a smooth ride that my son actually falls asleep after being pushed for a while. The sun shade is multi-positioning for different angles of the sun. Great 5 pt harness with padding around child’s neck and chest. Another great feature, the handle is also height adjustable. Super easy open and close with one hand. This stroller is not heavy like my old travel system. LOVE THIS ONE!!!! This is by far the best most sturdy stroller. There are just not enough words to describe how awsome this stroller is. You really need to check it out yourself, call or go down and talk to someone and compare the weight and price and this one has the rest beat hands down!!!!!! (Lightest full size sroller thats NOT 300 dollars) I would buy nothing else! I just bought this stroller a week ago when my excellent Combi I-Thru wore out after about 1500 miles on it in 6 months. Things I like about this one: easy to assemble. the seat is very well-padded, the basket is large and easily accessible. it seems to be a sturdy stroller, although it is a bit heavy at 23 lbs and feels like pushing a large square. the stroller handle folds down, which is helpful if you are trying to squeeze the stroller into a smaller restroom stall! * on the second day, the wheels started squeaking and the canopy refused to stay in the middle position; it kept dropping down to the lowest position. I will probably exchange it for these two reasons. * the peek-a-boo window in the sunshade has no cover (most other strollers do – even my Combi umbrella model). this problem was solved by the addition of the RayShade — a must for sunny/hot weather! * the handle position is adjustable but does not lock firmly in place. there is some play in it, which makes it a little hard to lift/lower the stroller when going up and down curbs. * the seat adjustment lever feels a little flimsy to me and the different positions are not very clear (my opinion). i always need to give a little push on the seatback to make sure that it is locked in place. * a personal preference — i like the shoulder strap clips that attach to the belt strap from the side, and not from the top. I had a Graco LiteRider that I hated because it didn’t have 5 point harness and my daughter always hit her head. THis stroller is wonderful! I bought it because it had a parent tray and child tray, it has a nice big storage basket (though hard to get to when seat is fully reclined). It manuvers wonderfully and feels so light to push. THe seat is nice and big, plent of room for a chunky child. The adjustable hande is great, except that it makes the handle almost feel loose (especially when pushing down on handle to get front wheels up a curb). I have an SUV and don’t have a problem getting it in and out myself. I wish I’d bought this first instead of wasting my money on the Graco. This is a wonderful stroller! I love how it reclines, super smooth ride, adjustable handles, big basket, and snack tray! Love how you can push it with one hand, it’s so easy to push you could probably push it with one finger! I was looking at the Graco top of the line stroller as well. I liked Graco as well especially the sunshade, but figured this has a better resale value. I realy liked this stroller except for the harness is too small I don’t see my 10 month old getting much use of this stroller. I just bought and I may have to return it for that reason…. i love this stroller to death. i had bought a jeep jogger but it just wouldn’t fit in any of our cars. i went back and bought this one instead. i love that the seat lays down flat and the visor comes off. the basket beneath is a bit small and the only way to get stuff in an out of it is to have the seat back all the way up. the handle bar also adjusts to height and i love that feature. the only thing i can complain about is that the orange was the only color available in the store. i love the green stroller but unfortunately wasn’t willing to pay an extra 40 or 50 bucks on shipping. BUT otherwise, it is the best stroller i’ve had and i’ve gone thru 3! I really love the extreme color in the car seat and stroller but I am so dissapointed that they dont put their best color in a travel system combo together. It makes me feel like chicco is just trying to make more money by making you purchase this combo seperatly. So I purchased the keyfit 30 combo on another site in the color race (which is red), since they dont have that color at babies r us. I love this system, and i would reccomend it to anyone. I bought this to replace two Peg Peregos that I had trouble with. I’m a sucker for a pretty face and stayed true to Peg’s until my last one lasted 6 weeks before bending. This stroller is attractive yet doesn’t feel like it will break before I can even take it on a walk! The material is sporty, water repellent and washable. The basket is actually large enough to be useful, which is more than I can say for my broken Pliko. I didn’t want to sacrifice comfort for my son, and this stroller provides just that–4 wheel suspension and rotating sunshade–a real must for Florida. Considering the features, this stroller is not that heavy; looks nicer than the Graco & is 6 pounds lighter. I bought this stroller for my new baby. It was between this stroller or a graco one. I was really sold with the graco because the sun shade was so big, but then i was also sold with the chicco for every other reason other than the sunshade. So even though the sunshade was small i decided the chicco had more things i liked. For ex: Chicco is so sturdy and you can feel that the second you start pushing it around. The material is water resistant which also means it wont make my baby sweat as bad. And the recline is a lever which is a snap to use (instead of a string which some other strollers have). I do miss having a large sunshade which is why i gave 4 stars. If it had a larger canopy this would be the perfect stroller! But i still love it, and would reccomend. I am a first time mom. This stroller is so easy to use! It is lightweight and can be used single handly! Completly recommend! This stroller is very nice. My husband put it together very easily, everything snapped into place and it only took about 15 minutes. We pushed it around the house and it maneuvers nice and folds up quick. We got the keyfit 30 car seat last month, and the car seat snaps into the stroller very well and looks great. Can’t wait to use it when the baby comes in a few months! […] I recommend this stroller! This stroller is really easy to use and relatively light weight. It folds down with ease and isn’t too bulky. My 2 month old son LOVES his walks in this stroller, very comfy. its easy to use folds up nicely light weight I’ll never need another stroller. my oldest is 6 years older than her baby sister and the stroller that i had for her was awful i had to take it apart to get it in the car. this folds up great doesn’t take up a lot of space. I absolutely love this stroller. It is very easy to handle, folds up easily to put in trunk and pops out easily. Our son sits in his carseat and we put the carseat on the stroller. We go for daily walks and runs, go shopping with it,and travel with it. Our son is comfortable in it and falls right to sleep. Great storage on top and bottom. We have many Chicco products-all excellent quality- well worth the money!! Have been using this stroller for 3 months and I am really happy with it. It is made durable and I love the orange fabric. The fully reclining seat is great for a newborn. The basket is a good size and will hold my diaper bag. The canopy can be flipped back and forth for coverage. It does not go all the way down so sometimes sun sneaks in and disturbs baby on the sides. It folds up nicely and stands upright which makes it easy to get into car. It runs smoothly and we like the adjustable handle. I had a Peg Perego Aria which I was happy with for only about 3 months. I really didn’t like that the basket was so small, and how there wasn’t a parent tray for it. This stroller has everything that you could want as a parent. The parent tray, a very big basket underneath, one hand open/close, and my son seems very comfortable in it. It is very easy to set up, only took me 10 minutes. You don’t kick the wheels when you are pushing this stroller like you do on many others. The adjustable handle bars are great, as my husband is taller than me. I would never spend the amount of money I did again on the Peg Perego brand, when you get so much more for your money with Chicco. I love this stroller! Our daughter has very low tone due to Down Syndrome and finding a stroller to fit our needs and her comfort has been a challenge, until now. We have bought 3 strollers within the last year and now have one she can finally sit in….the support in the head area is great with the sides coming around like they do, it helps her hold up her head when sometimes she can’t any longer. I am thrilled with how easy it folds and closes, I do wish the shade was larger but you can buy add on sun shades its well worth her comfort. Also love how it folds flat for a nap. i use this product to take baby for walks around the neighborhood so its never stored in my car, its a bit big for that and i have a full size suv. the material is great for wiping and verry durable, and the colors they have to choose from are very practical. now the problem on why i prayed the store would take it back without a reciept is this stroller was of no use to me after a month, my baby got a little bit bigger than when i first got it he now weighs 16.5 pounds and he is to broad shouldered to sit in it. his shoulders would be all crunched up and he had to have his hands in frontof him. plus the straps are super bad they are made for skinny babies wich i dont know to many. they i haave no leway to pull on them. if you concidre this stroller try and take a 5 month old with you and sit him in it you will see what i meen. wish someone had warned me! LOVE the adjustable handle for my 6’3″ husband who can push it easily without bending over and having his feet catch the wheels when walking. It’s weight is right in the middle of the pack of the strollers we looked at and it is a more compact than others in similar styles. After a little time learning the buttons and adjustments we love all the features of it. It’s easy to lift by the handle after it’s locked into place. Couldn’t be happier with it. This is a great stroller that moves with ease. It is so easy to steer and maneuver around in the stores or outdoors. It is really lightweight and easily folds with one hand!! I love the orange color, it makes it unisex! I would tell anyone to buy this stroller! We had the Aura at first, and we got rid of it because it was too bulky and hard to maneuver!! This is a great stroller and totally worth the money! I purchased this stroller as part of the travel system, but it really wasn’t the one I wanted. I did use it for a while and it does have some really nice features! The handle accomodates tall people which is great for my husband. The seat folds completely flat which was great for my stomach sleeping newborn. I traveled with it twice and was able to use the stroller as a bed for her. It was too bulky and I didn’t want a stroller that was so cumbersome since I also have a 4 and 6 year old to tote around. I have an SUV and it still took up a lot of room and was a pain to lift in and out especially since I’m a mom on the go. I tried selling the stroller and the person who wanted to buy it put her 2 year old in it and he was totally squished in the shoulder! I was really surprised! If you are thinking about buying this stroller for the long-term, keep that in mind! Try it out with an older child first!!! I have this stroller and the Keyfit30 car seat and I really love the two together. The thing I like most is that I can completely enclose my baby with the sunshades on the stroller and carseat so he can nap in a nice quiet/dark place. It also is great in a cold climate because it keeps the wind off of him. The tall/adjustable handle is great and the parent compartment is so convenient. I can fit my cell phone, keys, Purell and tissues in it! It is a bit difficult to get bags into and out of the basket when the seat is totally reclined so the carseat will fit, but it is still functional. I just put my shopping bags in the basket below and hang my diaper bag over the handle. I would definitely recommend this system to a friend. I did a lot of searching before deciding on this stroller. Truly, it was a toss up between this and the Graco Quattro Tour Deluxe. The reason I chose this one is because my hubby just had his 3rd back surgery and this stroller, when folding it up, stays upright. The Graco folds flat down to the ground… not a good idea for someone with back problems. Anyway, I’m glad I chose this one. It has a smooth ride, our son is very comfy in it, the height adjustable handle is awesome, the basket is a great size, the fabric cleans up easily, it folds up easily. The only thing I would change if I could is I wish it folded up a little more compactly as it takes up quite a bit of room. Other than that, it’s an awesome stroller!!! Let me first say that I have had several strollers of which I have either given away or had to return. This stroller by far is my favorite. I currently have a six year old, a two year old who is a tall for his age and a three month old. My two year old is an escape artist and needs to be in stroller on most outings. He has managed to undo the seatbelt on every stroller I have tried. This particular seat belt is impossible for him to open on his own. As far as the stroller is concerned, it is very light weight, easy to put in and take out of my car. I don’t find it to be bulky, I drive an Odyssey and I have no problems what so ever with plenty of room for shopping etc. It folds and unfolds easily. It has great control, and moves very well. Most of the lighter strollers are difficult to control, especially if you have a larger child or try pushing one-handed. I am usually pushing my two year old while my three month old is either in my arms or in the baby bjorn. (And forget about the double strollers, I have the issues with the seatbelt, then I end up pushing an infant in a huge, heavy, double stroller. This is so much easier for me. )I love the fact that the handle is adjustable, this comes in handy for my husband and myself who are tall. I like the tray, which is removable. The fabric is easy to clean and it looks great. I love how the seat is enclosed on the sides like a full size stroller. My little guy likes to hold onto his stuffed animals and blanket. With this stroller, everything stays inside instead of getting caught in the wheels or falling onto the ground. The seat reclines completely, which comes in handy when he falls asleep. With the lighter strollers, his feet would dangle past the foot rest or set on the wheels which causes problems with steering and pushing. Not with this stroller, as I mentioned earlier, my son is tall and his feet set nicely on the foot rest, they don’t even come close to hitting the tires or the ground. I use this stroller on a daily basis and absolutely love it. I am sorry if I have rambled on, but I have seriously gone through around eight strollers in the last five years and this is the first one I have really liked. Also, I have a graco snugride carrier, which does not click onto the stroller, however, it sets completely inside (not on top of)the stroller when it is reclined. Which actually seems much safer to me. My husband picked this stroller and I thought it was a little too big…but my daughter is 15 wks and she now rides in it, not always in the carrier (which is also nice), and its great. It supports her head and upper body well, and if she naps its like a bassinet. My 3 yr old will ride when the baby is not, and its great for her too, and easy for me to steer one handed. Dont hesitate to buy this stroller, once you get used to it, it will be your favorite (this is stroller #4!). I bought this stroller today and so far, I love it!! I took my 4 month old down to Babies R Us and we took it and several others for a test drive. It has all the things I was looking for. The basket is fairly large and very easy to get into. The handle is wonderful! It is GREAT for people of all heights! The stroller is easy to turn with one hand and was very easy to assemble. It took my sister and I about 10 minutes. Everything just snaps into place. It is pretty easy to close. I had to use two hands, but I’ve only tried closing it once. I’m sure with practice I can do it with one hand. It stands along when folded. It doesn’t take up too much space. I have a Nissan Maxima and still have decent trunk space after the stroller is in. It’s fairly lightweight. I wouldn’t want to have to drag it a great distance, but for my daily use it will be fine. The canopy is nice and big and I like the window. The seat does fully recline (just had to wiggle a little extra to get it to lay back all the way). My little man can’t sit up unassisted just yet, but the harness holds him in a sitting position and he LOVES it!!! He was much happier being able to sit up and look around, rather than lay back in the carseat. I am very glad I bought this stroller and would recommend it to anyone (especially tall people…I love the handle!!!). Very easy to put together. Love how you can open and close the stroller just with one hand! I use this stroller with my Keyfit 30 car seat. When using the car seat with the stroller…you can’t really use the basket underneath b/c the stroller is reclined…which kind of stinks. But it does have like a console area by the handle bars…a cupholder and a compartment for my keys…very cool! We got this off our registry to go along with the KeyFit matching seat to use as a travel system. They stroller is great except for a few minor issues. 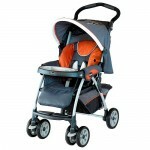 1) Like all other strollers in this category, it is bulky. 2) When using it as a travel system and the back is reclined all the way you don’t have such easy access to the storage bin underneath. Whatever you plan to put in there must be flat otherwise it won’t fit. 3) The bar by the back wheels easy gets kicked while I walk. Other than that its a nice smooth ride and easy to push. suspension, and is easy to use, the color is unique and unisexed. In fact, my husband loves using our stroller more then I do, and with the adjustable handles it works great for different heights (my husband’s 6’1″ and I’m 5’5″). It is super sturdy, the car seat can be inserted/uninserted easily, and it has a large basket too. The only minor downfalls are the price it is a little expensive if your not using it for futur children as well, but even then I personally would have bought it. The second downfall is that it is a little big, but it folds up nicely so it takes up less space then any other stroller it’s size, and you have to understand the stroller is made to equip a larger carseat/child too. So it really is a great buy! It’s a great stroller every where I go people always make comments on how nice it looks. It’s very easy to use you can actually close it with one hand. I also have the chicco keyfit 30 car seat and it fits perfectly in the stroller. The stroller is also great for older children my 4 yr old loves sitting in it when her baby brother isn’t using it. The sun shade is also great because you can pull it forward in front of the baby. I have had this stroller and the car seat that matches for 5 months now. My 5 month old loves this stroller and the carseat combo. A shame that they don’t sell both pieces together as a travel system (you have to purchase seperately). I have had no problems with this stroller other than the basket is had to get into. I have to swing my diaper bag over the handles but it’s no problem. I also own the Chicco Trevi in this color and the carseat snaps into both strollers extremely easy. We have two cars and wanted a stroller for each vehicle. This is a definite must. I am extremely happy with it and my son loves to ride in it. This is a wonderful product, I highly recommend it to any new moms. This stroller is great! It is lightweight yet sturdy…definitely one the of the easiest to push and turn. The color is great for boy or girl. I had no trouble putting it together in 15 minutes. I would HIGHLY recommend…worth the money! I am a mother of 2 and a foster mom…..I have seen my share of strollers. I needed one to take on vacation. I don’t have allot of choices where I live so I researched online. I really loved this stroller, but got a little spooked by some of the reviews…..saying things about TOO SMALL for toddlers (which is what I have), too bulky or too heavy. So I went to Phoenix and checked tham out. It is BETTER than I hoped for!!! *Plent of room for my 3 yr old…..with lots of room to grow!! *Lightweight and Folded easily ~ even my 11 yr old could fold and lift it!! *I can push it with one hand and hold my dogs with the other!! *Chicco stands the test of time ~ a friend bought one USED and is now using it on her second son!! They didn’t have the color I wanted, so I had to buy it online, anyway! Buy with confidence!!! You will love it! This is an all-around great stroller that’s worth every penny that you spend on it. The way the infant carrier latches into it is great, and makes it so easy to use. It’s also smooth-riding and folds up easily. Make room in your vehicle for this! The stroller was on a want list for my grand-baby. I’m always happy when I can purchase what my kids want. I have 3 boys and have had wow atleast 5-6 different strollers, this is by far our favorite. It folds up easily and is very comfortable and sturdy. We have the matching carseat and that goes on and off really easily too. Great buy! I LOVE THIS STROLLER!!! Assembly was quick and easy. It’s easy to open and close and for a mom with two kids you want a stroller that you don’t have to fight with everytime you use it. I love the adjustable handle bar. My husband can adjust it to his height and I can adjust it to mine. This is the first stroller that my husband has ever liked and we went through three of them with our first child. This stroller is a must have for any mom & especially a busy mom on the go who doesn’t have time to figure out how her stroller functions each time you use it. I also purchased the car seat and that is amazing as well. I first bought another stroller which was of similar value, but my baby didn’t enjoy it much. My sister has a bay younger than me by one month and let me borrow her strller when we were both out. Penelope NEVER and I do mean never falls asleep on the stroller, but because it reclined all the way she slept just fine. We live in the desert in a very hot area and the stroller blocks the sun just right. I loved it so much, we just bought our own, […] HeHeHe! But seriously I’ve worked as a nanny, pre-school teacher, I ‘ve worked with toddlers and babys this is deffenetly the best stroller I’ve used. Kudos to Chicco!!!! I LOVE THIS STROLLER!!! Assembly was quick and easy. It’s easy to open and close. I love the adjustable handle bar. My husband can adjust it to his height and I can adjust it to mine. This stroller is really nice, light weight and easy to use. the only thing is that when the car seat carrier is lock in use can’t access the storage basket on the stroller because the seat needs to be in a full recyline position. otherwise really good purchase and very easy. I brought this stroller to take to WDW instead of my umbrella one. It was great folds easy, love the parent and child trays, the large storage basket underneath and that it fully reclines. I wish I would have found this when my son was first born instead of getting all the other strollers I own. Best Stroller! It is so easy to fold up and set up. My son loves the stroller so I have it in the back of my car and everywhere I go I just put him in it. Very easy to use and well worth the money. We love this stroller! It’s one of the best rated strollers by Consumer Reports. It works perfectly with the Chicco KeyFit 30 car seat. So easy to click the seat in and go. Took my 10 month son to the park with this sweet new stroller and as soon as I put him in, his shoulders looked scrunched. The little side things were too narrow and it looked uncomfortable. The buckleing was very hard to work. My wife and mom had to give up. Returned it and looking for that special one. I have to say I have had 3 Gracos, and 1 Evenflo and the Chicco far surpasses them!! It is easy to use, and very stylish!! It is lightweight and easy to steer. I can’t say enough about my Chicco. I also have the matching carseat. I love this stroller for several reasons. 1. The ride is really smooth. It’s easy to push around and doesn’t take a lot of effort. 2. It is super simple to open up and close. I can do it one handed. 3. The look of the stroller is classy. It doesn’t look cheap at all. 4. The stroller is heavy, but it is extremely sturdy and doesn’t feel flimsy. The only thing that I do not like is that when the seat is fully reclined, the basket below is hard to access. But, all you have to do is raise the seat up, put your stuff in, the put the seat back to its reclining position. The basket is really big and holds a lot of stuff. Great stroller overall. Honestly, I have not tried any other stroller but I don’t need to. I love the Chicco!!! my husband and I love this travel system. It was the lightest weight of the ones we liked. Colors are great. Love the heavy duty wheels for rainy days or beat up parking lots. Car seat snaps in easily to base and to stroller. Stroller alone works great for infant as well. Love the adjustable handle. ONly complaint is that when carseat is in stroller you can’t store much in storage compartment below (but I just put the diaper bag over the handle and it works fine). I adore this stroller! I go for walks, go shopping, and pretty much take this everywhere! I use it with the Keyfit Carseat – snaps right in and off we go! Easy to fold up and fold down – can do it with one hand. Handles also adjust which makes it very comfortable for my husband to use too. Only con – is that it does take up a LOT of space when folded up – takes up about half my trunk. But other than that – it’s great! This product was very disappointing. Very weak, Heavy and all around cheap. Some of the plastic joints were broke when I opened up the box. My words of advice, Don’t buy this to save a few bucks. You will pay one way or another. Me I got a refund the very next day after the purchase however it cost me time and aggravation. Shell out the extra bucks for a superior product. It always works out better that way. This stroller is so great. The best part is how easy it opens and closes, it can be done one handed. The car seat just snaps right in. The stroller is so easy to steer, it can also be done one handed. Would never buy any other stroller. This product is really great, i decided to buy this product because i have read a lot of pretty good reviews about it, and gottcha its really a good thin to read its worth it though its a little bit expensive plus the car seat but its worth it. THis is safe and sturdy but it weigh a little less than most of the strollers out there. Easy to maneuver and open and close, too. Only thing you cant put anything on the basket when its fully reclined esp when yoou are still using the car seat in it but thats nothing to worry as long as your baby is safe and sound. You can also hang yoou bag on the handle and its still works out fine. This stroller is awesome!! I have a toddler ,I have been using a basic umbrella wow what a difference this is. The first time he rode in it he did not want to get out. Easy assembly does not seem too heavy feels very durable. Basket spacious and he loves the tray for his snacks and cup. Love Love Love this stroller. Love this stroller. […] I would like to see the handles adjust heightwise as my hubby is really tall (6’7″) and he has a little trouble with pushing it around comfortably, but that is his issue as it fits me just fine. Our son is 6 mos old and he loves going out in it. Overall wonderful quality and a great stroller!! We love this stroller! We have is in the red Race color. We’re using it with the keyfit30 carseat as a travel system right now. The carseat is easily clicked in and taken out. The height adjustable handle is great for me and my husband and the parent tray is nice. It steers easily with one hand and has shocks that absorb bumps well. I like that you can take the kids tray completely off and pop out the grey insert to be washed. The storage basket is generous though it is hard to get to with the seat all the way down, which is has to be when used with the carseat. It folds and unfolds easily but is bulky and slightly heavy, which is common for full size strollers. The canopy is great when used with the carseat but could be bigger if the stroller is used alone. I love this stroller, i’ve been using it for about 7 months now and its easy to walk with and easily stowed. Its also very cute to look at. I googled stroller for tall parents because I am 5’10” and I remember how hard it was not to kick the back of the wheels in the strollers I used for my two older children and found this one. After reading the reviews I decided to give it a go, I am all about advice/recommendations from other parents and I couldn’t be happier. Our newborn son is safe, lying flat and even has the bottom where his feet go to snap up like a bassinet. Its nice and tall and easy to push with one hand. I also wanted a stroller without the two handles to make one hand pushing easier. Love it. Strollers sure have come a long way in the last 5 years since I had a baby. I would recommend this product to someone. It is very roomy for my 13 month old. I have even put my four year old in it. It has a lot of storage space. I love how the seat has a built in head rest. So if I don’t notice the baby has fallen asleep his head doesn’t flop forward. It has a smoothe ride. My only complaint is it’s bulky and a little heavy. It takes up most of the room in back of my Honda CR-V. Be careful to put the brakes on before you fold it or you will get smacked in the shins! After having the Baby Trend Zanzabar stroller for about a year-and having it fall apart-I was ready for a new stroller. I did a little research and tested a few out in the store. I bought this stroller with NO hestitation. I LOVE IT! I tell my husband its like “budda”(butter) when it comes to steering. IT just glides effortlessly. I can now open a door to a store and push the stroller through with EASE with one hand! The storage basket doesn’t look like its going to break(my zanzabar did after 3 months) I’m so completely happy I bought this stroller..and its really light weight compared to the other one I had. Its easy to fold-easy to steer-easy to lift into the trunk of my Neon. LOVE IT LOVE IT LOVE IT! and my 1 year old daughter loves it too! I am the mother of two and this is the fourth stroller that I’ve owned and nothing else compares to this Chicco. It’s the first one that has an easy to access compartment underneath. It steers like a dream and is so easy to fold up and open up. […] I honestly can’t say that I have any negatives to add to this review. Oh and the covered compartment by the cupholder is so great for my cell and keys! If you are on the fence about which stroller to get like I was I strongly recommend you go get this one! Love it!! This stroller is easy to fold and unfold, and it can be steered one-handed. Our daughter absolutely loves riding in it. She has lots of wiggle room, and the canopy offers good shade. It was even easy to assemble. There is lots of storage underneath as long as the seat isn’t fully reclined, but that’s the only drawback. It’s still a wonderful product. This stroller handles beautifully! It’s fun to drive, turns on a dime, and has great storage. My husband and I are both tall and this stroller has an adjustable handle bar making it so much easier to push. I have been walking more just as an excuse to push this fun stroller! Our son couldn’t be happier!It also folds up well and fits with room to spare in the trunk of our Altima. I absolutely love this product. I also purchased the infant car seat carrier that coordinates with it to make it a travel system and am so happy with it. I researched alot on strollers and went to all the stores to compare every one out there and kept coming back to the Chicco. It is a bit heavier than most but it’s been the best investment we’ve made. I adore this stoller as does my husband and daughter. I love how easy it is to fold and that it folds up to me instead of down to the ground. It fits in the trunk of my Camry with room to spare. My husband loves the adjustable handle bar and it must be comfortable for my daughter since she falls asleep in it almost every time! The only drawback is that the sun shade is a little short and doesn’t have a cover over the little window at the top. Our little guy is 11 weeks old and we are loving this stroller. The full handle bar is so much more convenient then the separated handles. The basket holds so much stuff and you CAN access it while the seat is in full recline. It’s in the medium weight dept and fits nicely in the category of between a stroller umbrella and full size heavy one. Fits nicely in the trunk of a compact car. I did a lot of research, so you don’t have to! This stroller is the absolute best out there. It is a little heavy but it is tough and rides like a dream cadillac. The price is great for the value. I have 2 kids my oldest is 3.5 and big at 48 lbs and my youngest is just 7 months. I like that I can use it for both and it steers great either way. I am very impressed with this and would recommend to all. The complete reclining seat is great for my tummy sleeping baby. I love the colors and the versatility of this stroller. I love my stroller. I am a new mom and it works great for my son. The stroller is easy fold up and push around. There is plenty of storage space and also easy to clean. I love it! Went to Babies R us and tried every single stroller. REALLY! And after having two kids and going through 4 other strollers, this one is the best. And not the most expensive! Great basket, lays down all the way, easy to fold, not too heavy, cup holder, all the bells and whistles. It is a MUST HAVE! Love it! I bought this stroller after looking at TONS of strollers online. We went to BRU and tried a few, but we just couldn’t put this one down!! It is so smooth. My 1 year old and my 5 year old can both ride in it. The storage basket is AWESOME. We really like this stroller. It is not heavy to push and is very easy to use. We were worried that we had wasted our money on it thinking we would not use it, however it has been a life saver for mall trips and other activites. Our daughter will only ride in it for a little while then she is tired of it, but she does not like to be put down for any reason so it is not the strollers fault. It works great with the Chicco Extreme car seat or without. Baby can lay down all the way, recline a little, or sit straight up. WORTH THE MONEY!!! I love this stroller, it fits perfect with the 30 key car seat. It provides great coverage from sun and the stroller moves well and is easy to manuver. I walk with my son daily and this stroller glides easily over bumps and cracks in side walks. It fold up easy and is light weight. Absolutely dislike this product and attached infant seat is even worse. My child was always uncomfortable in infant carrier. Also carrier top cover does not keep sun away. Strollers cover does not keep sun away either. Stroller and carrier and not soft and if child is not really heavy, he seems so uncomfortable and head is not positioned right. Also, in the stroller my child cannot sit up right he is always slanted and hates it because cannot reach front tray to play and basically I hate this system/stroller and should have just gone with a Gracco. I would buy this stroller again and again it is so great! My son is big a big boy (8 months old and 23 lbs 31 inches long) and he fits great in it. Sun protection is great. Here in AZ it is sunny everyday, so we tested that time and time again. The basket is the perfect size. My favorite feature is the adjustable handle height. I am 5′ 9″ and it is hard to push a stoller with low handles for any length of time. This is great because I can walk upright and hold the handles great. So comfortable! This stroller is so light weight and fits perfectly in the trunk of my corolla with room for more! The only thing is the basket does not push down, so you do not have access to it when the infant car seat is attached. I can squeeze small things in there and I hang the diaper bag from the handle. Other than that it rides smoothly, its not heavy and bulky like a graco, and its less expensive than a peg prego. I love this stroller. It is so lightweight and a snap to get it ready. The only downfall is I wish the basket was a bit larger and easier to get to when the car seat is attached to the stroller. That is the rason I did not give 5 stars.The colors are awsome. Many compliments. I have not had a problem with the sun shade. I use the Chicco Key FIt 30 in extreme with this and if I use the sun shade on the car seat and on the stroller I have no problems at all. Lightweight and easy to use. The car seat goes in and out with little to no effort and yet it feels very secure for our little bear. We are pleased with the CHICCO line and highly recommend this product. The only request I would have to the manufacturers would be to have more color choices. I am not big on the orange or the green. But the safety is more important than the color!! I truly love this, it handles great folds nearly flat, I have used nonstop… I love that it lays down so baby can nap. Wonderful stroller can not say enough good things. One flaw only is that if the wheels are not perfect it will not fold up ….most likely my fault. This stroller is very easy to use. The car seat snaps in and out very easily, the ride is extremely smooth, both on and off road, and I love the adjustable handle. I also love the cup holder and key/cell phone compartment that snaps shut. This was a great purchase! it can’t get better than this! A full size stroller with a lightweight feel. I like this stroller a lot easy to use, with one exception the storage basket. I wish it would fold for better and easier storage and I also wish the seat was a little softer. Other than that I have nothing but good things to say. The ride is very smooth,manuvers easily. The cupholders are great for both mom and baby. My son’s father loves the adjustable handle. I would recommend this stroller and possibly buy again. We absolutly love this stroller! It is stylish, lightweight and easy to handle. Love this stroller. She falls asleep in it all the time. We love our 2 mile walks in it. Is smooth and goes over curbs well. Plenty of room to keep water bottle, phone, MP3 player and pacifier within reach. It was ok at first, however, now that we use it for walks, the wheels are squeeky, and it doesn’t fold very flat. Also a little cumbersome to hoist up into the back of my Expedition. I don’t think my son likes it much either b/c after sitting in it a while he gets squirmy since he can’t sit all the way up, he’s in a reclined position the whole time we walk. I do like the colors and storage though. It is pretty much a full size stroller, so it doesn’t leave much room in the trunk, but the way it steers and folds/unfolds make it pretty conveinient. The canopy is a little small, but otherwise I have no big complaints. The wheels do squeak a little, but my hubby put some WD40 in there and now it is perfect again. Material is very easy to keep clean. We are so happy with this stroller for our second child. When our daughter was born…we went with a Graco travel system b/c we were ‘rookies’. It was never a good fit for us…and the infant carrier was never secure in the stroller. When we went to look for a travel system for our son, my husband went down the line of strollers at Babies R’ Us and literally lifted all the infant carriers from the Graco’s by the foot…they just don’t secure in…only the top portion clicks. When we got to Chicco, I first saw that they were a bit more than the other brands…but after a test drive through the store, we realized it was a great fit for us! I also love that the infant carrier (Chicco KeyFit 30) is rated up to 30lbs…that is such a plus! The colors are fantastic and the fabric is super easy to clean. My 6-3 husband loves the adjustable handle, so he isn’t always kicking the bottom of the stroller as he walks. It doesn’t fold flat, but not many full size strollers do! It is the easiest to collapse and open though, I can do it with our two month old in my arms! I use this stroller probalby 5 times a week. The travel system with the keyfit30 works great and is easy to use. The stroller by itself is easy to use as well. It folds up nicely and is sturdy. I have had it for 6 months now and i have used it on grass, gravel roads and dirt and i have had no issues with the wheel direction, squeeky wheels or lask of sturdiness. It glides nicely and i am happy with this purchase over the trevi. My son has sat in the stroller on several walks and does fine and falls asleep (although he is only 5-1/2 months old). I wish it had a bigger canopy for more coverage but i just push further than its typical position to help block sunlight. Lastly, it is a bit heavy but i don’t have any height issues tossing it in the back up my Dodge Ram 2500 (4×4). Great stroller the only thing I hate is the fact my son sweats really bad in the stroller and carseat. Everything else is great! Had to purchase a “summer” stroller so my poor son doesn’t have a heat stroke in it! I would not have spent the money on a stroller my son sweats in! I hated it. I am use to just using the “snap and go” (the best invention ever), but my 7 month old son is getting to big to be strapped into the car seat when we are out and about. I’m also 5 months pregnant. This stroller is just way to big. I have a sadan and it doesnt do to well in the trunk… I couldnt fit anything else in there if I tried. I weighs to much to lift in and out being pregnant, it just strains my abdominals. And on top of that it left blisters on my hands after using it for maybe 2 hours! I did like the car seat though. I have the whole travel system. The car seat fits really well with just a click. That’s great! The only thing about it that I don’t like is that the buckle is so very complex. It took me about 10 min. just to figure out how to snap it! Then when I went to unsnap it it was too hard to get undone. I had to leave it snaped and slide my child out of it. It’s still snapped to this day! I’m disapointed because they made the car seat great and of good cuality. They made the stroller cheaply. It is small and pretty easy to open and close. It’s just bulky when closed and in the trunk. Probably not as bulky as some though. its pretty heavy to handle,putting in the vehicle and removing was a big work..and its not that easy to fold and unfold it..my hands started to hurt…mostly my husband does it now..but i could not do it alone..I dont understand watz up with the chicco items..i bought most of the chicco items looking at the reviews..they r durable..ofcourse..but material they are made up of isnt good..its rough and gets too hot..its the same with the stroller too..my baby sits in it fine..but after some time its gets too hot n sweaty n he feels uncomfortable..they better improve the quality of the cloth,in the stroller and carseat. This is one of the smoothest stroller I have ever handled. Though it doesn’t fold up width wise it fits in my trunk exceptionally well. i should have bought this before i gave birth to my son of 11 weeks. We have the whols travel system and the car seat is great, we have complaints but the stroller was great the first month and then the wheels started squeaking all the time. I tired everything the manual said, washing the wheels off, using some lubricant and nothing worked. Finally called Chicco and they sent another set of wheels. After a couple of weeks, it started all over again. Should have just gone with the Graco we originally looked at. The shades on the stroller and car seat are a joke, they don’t keep the sun out of the babies faces because they are so small. This stroller is just about perfect. It is the first stroller where I feel whoever created it must have kids. So many features…easy access to the large basket, one-hand fold, adjustable handle-height, cup and snack tray for parent, cup and snack tray for child that can be removed and washed in dishwasher, stands up on it’s own when folded, adjustable and removeable sun shade, easy to use brakes and is so lightweight. I can push this easily with one hand. I’ve never seen another stroller that had every feature like this. The only negative thing I could say is that is is not compatible with other car seats. I have peg car seat and I can still use the stroller, it fits snugly but does not snap in. I liked this stroller much better than the peg stroller and you can’t beat the price!! This is the 5th stroller I’ve purchased…this one has everything and my husband said I finally got it right. We both love it. After doing a lot of research I decided to try the Chicco Cortina, and I’m so glad I did! I needed a new stroller for my new baby since our Combi was worn out after 5 years of use. I tried this out in the store and loved how it pushed. Now that I have it I love it even more. It pushes easily and is great for my newborn to my five year old (who weighs nearly 45 pounds). All three of my boys love to ride in this stroller. I love the large basket and parent organizer. The canopy is great. It can be extended to different positions to keep out the sun’s rays. It is also easy to keep clean. Just wipe it down and go! I love the extended food rest for my baby. It’s almost like a little traveling bassinet and he loves the smooth ride. If he’s ever fussy a ride in this calms him down. This is a full size stroller, so you can’t expect it to fold small, but it does fold easily. If you’re looking for a full size stroller you won’t be disappointed in this one. We love this stroller! Not nearly as bulky as Graco models. Easy to steer, adjust, and collapse. This is a very smooth ride for our son. I wish we had bought this from day one. It’s easy to fold and maneuver, and for a super tall mommy like me, the adjustable handle is fantastic. I also love how my daughter can comfortably lie flat and as an infant, doesn’t have to remain in her car seat… which can be hot here in Texas. I’ve also done diaper changes in it on the go too. Great stroller. I use this stroller with and without the KeyFit30 seat almost every day. My 5 mo. old has been comfortable in both since we brought him home in his seat. He is now big enough to go for a ride without the infant seat, and loves to sit up and look around. The stroller is easier to close than open, but I usually have to do both one-handed b/c I am holding my 18 lb. son. It is not heavy, it handles very well on bumpy sidewalks and gravel roads. The wheels have a slight squeak but it doesn’t bother me or my son. I don’t think the material is too hot. My son gets too hot if I dress him in the wrong clothes, not b/c of the stroller or infant seat. The sun shade is not perfect, but it does the job- I just have to adjust it depending on what time of day it is. I would recommend this stroller to any of my friends, and a lot of them have remarked on what a great stroller it is as well. A person at a store once called this the “cadillac of stollers” and they are right! You get what you pay for and after 8 months and a recent vacation to a lake where we took the stoller off-road, it is still in great shape. It’s a little heavy for a weak Mom, but so isn’t the baby and I still love her! It is easy to fold up and it works great with the car seat. My husband and I recently purchased this stroller and the KeyFit 30 carseat after hearing of the new carseat. We had previously owned an Evenflo travel system. We love the stroller having taken our 5 1/2 month old for walks; however, after taking our son on his first vacation, we have realized that the stroller just does not fit into the trunk of our car (G6). It just seems to be too bulky and has proved to be quite heavy when you are holding an 18 lbs baby too! I still have not been able to open/close it with one hand. Other than the size and weight, we have had no problems from it and love the reclining seat and maneuverability. I would recommend this to anyone! I love this stroller. It is extremely easy to maneuver with only one hand. It is easy to fold and unfold. Nothing complicated about it. I put it together myself without any problems. I just had my third child and bought it for him. My daughters are grown, 18 and 22 yrs old and I am very pleased with the improvements that have been made as far as strollers and carseats go. They are so much easier now. I bought the carseat that goes along with this stroller and love it too. You just sit it down in the stroller and it ‘Clicks’ right in. I did my research before I bought these items and they were both at the top of the list of Consumer Reports which is one of the main reasons that I chose them. Looked at many in stores and was not impressed with most of the other choices. Could not find either the stroller or the carseat in a store and had to order both and am very pleased that I chose them. This is our second stroller in 6 months. We had a Baby Trend Jogger but my son screamed and cried every time he was put into it. So I decided we needed a different stroller. I went and tested a ton of strollers with him and he loves this one the best. We were able to get it in the green which was very nice.I do wish that it had two parent cup holders but over then that it is great. I love how easy it is to fold and unfold and it is light enough that I can take it out of my trunk and unfold it with one hand while holding my little guy in the other. It also fits easily into my compact car’s small trunk. The handle bar is very comfy and adjustible for me or my over 6 foot hubby. The material is easy to wipe clean and sturdy. It rolls VERY smoothly and goes over many surfaces easily. When fully folded and the handle is down, it fits in the trunk of our Saturn SL2, with a little spare room for a couple of bags. It opens with one hand! It has a large storage bin below. It fits a 14 pounder and looks like it will fit a 30 pounder as well. It isn’t as light as we wanted, but we liked its smooth and sturdy handling and felt it was worth it for one hand opening. It has a useless sunroof. There is a peek hole, but nothing to cover the peekhome. The roof itself doesn’t move nicely and doesn’t have enough coverage. The seat belt is a little hard to adjust. The material is sturdy on the stroller and carseat, but seems hot for my child, but I live in AZ so it could just be that. The seat belt was the first thing to give up on me (after three months of ownership); with only one of the two belts latching properly. The sun roof is pointless, as the top portion of it has a peek hole that allows full sun to enter into the seating area often blinding my child. And just yesterday (after less than one year of ownership) the stroller was unfolded for use and when I went to fold it back up ***IT WOULDN’T FOLD! *** The internal springs allowing it to fold just gave way (mind you they had been “sticky” since day one making it a TWO handed difficult fold; not a one handed easy fold as advertised). Also, the storage compartment below the seating area should under NO circumstances be pulled out to be cleaned because once washed the buttons won’t stay buttoned – making for a useless storage compartment. This stroller is great. It is not very wide and easy to maneuver. It is extremely easy to assemble. We are able to use a different brand carrier seat on it and it fits well. I am short (5’0″) and my husband has a bad back and we are able to easily lift it in and out of our SUV. The features are pretty good too: adjustable height handle, wide basket, one hand open and close, a cup holder and an area to place keys or cell phone that closes (you can also place a second cup or water bottle in this area). So glad we chose this stroller. I bought this as part of the travel system. My baby boy has outgrown the carseat, although as an infant he was very snug and safe. The stroller however, needs help. The straps do not fit well and my baby is so uncomfortable, he cries each time I put him in in it and the quality is shotty, one of the snaps broke the 1st day we used it. I’m sorry I bought this. We have used this stroller every day since my son was born 5 months ago. We have used it with and without the carrier car seat and we love it. It is very portable and fits easily in and out of our trunk (toyota corolla). Easy to steer and goes over rough terrain well. A great buy! we love this stroller, it is nice and it turns nice. it is a little big but almost all full size strollers are. the basket is wonderful. love the cup holder. the seatbelt is alittle problem though, my son is 9 months and it is still to big for him.but he can grow into that. love the handle. it is a good stroller, and worth the money. this is one of the better strollers out there. I only use this stroller maybe 1-2 times a week if even that, it is my 1st stroller so I have nothing to compare it to, but for the money its pretty good. I like the travel system, the seating is ample, reclines easy, love the cup holder and the little compartment to put my phone and keys and it rides well. I am not the only one but I agree that the sunshades are not large enough (I really like the Bugaboo, but $500! ), the basket is large but hard to get to when the seat is reclinded. I am not sure about the material, my son did get a little hot in it this summer and he did cry and when I felt under his back he was really hot…thought it was because we live in AZ, but it sounds like others have the same issues in other states…when the weather is moderate…hopefully Chicco will change this. The sunshade on the stoller is a joke and its not large enough, wish the stroller turned around so that I could see my child (oh well) I does clean very well. And if you are on a budget its well worth it. We purchased this stroller for the first time two years ago with our second baby and have gotten it again with our third. It was great!! Easy to manuveur, steer, fold, everything about it was easy. We loved that we could fully recline the seat and pull up the footboard to do a closed in bassinet. We also loved how easy it was to clip on the stroller. And with OR weather the way it is it really came in handy to be able to overlap the sunshades and create a canopy over our little one. My husband also loved the handlebar that had an adjustable height. All in all it is a great stroller for a great price. The only problem we ever had was that when unfolding it would sometimes smack me in the shin. The sun is always in our daughter’s eyes. The visor is too high and does not adjust. The bin is inaccessible and impractical. We have to put everything in the diaper bag and hang it from the stroller. There is no storage. The cup holder is always falling off. It is small and easy to open and close. I would NOT recommend this stroller. I really like all of our Chicco products but would not recommend this stroller. I have seen other Chicco strollers which have a bigger bin and visor. I would advise that you look into these other strollers. I’m writing this review after using Chicco Cortina Stroller and the Key Fit 30 car seat for 11 months.As a big cons I would add folding and unfolding. If someone else wants to do it for you and you try to explain to them how to do that many of them just don’t get it. The fact that you have to use both hands to fold/unfold, especially unfold can be a very inconvenient thing. It is easy while the baby is in the infant carrier so you can rest him on the ground, but when the child is between the carrier and walking on his own, and you are alone with the baby, it’s really hard, so I had to risk few times by having my 10-11 month old stand and hold on to something outside while I’m unfolding the stroller. I liked the chicco key fit 30 carrier ( even though you’ll soon find out that you really do need that shopping cart compatibility that this car seat is lacking, because you either have to put the carseat inside the shopping cart so it takes up the whole cart or you’d be pushing stroller and the shopping cart together so I kinda had to buy the compatible stroller for it, so it had to be either these or Chicco Trevi. It is also very bulky and sometimes hard to put in the trunk. Sometimes you need to adjust the harness while the baby is in the stroller and it is not so easy. I don’t think I would buy these stroller again. After much deliberation, we chose the Cortina along with the Keyfit 30. Our son is 9 months old now and this has been our only stroller so far. We are considering an umbrella stroller now, but I am not sure I want to give up the conveniences of the Cortina even for the smaller size and lighter weight of an umbrella! 1. The sun shade is sooo much bigger than the Trevi and folds all the way forward to the snack tray for when the sun is head-on (the Trevi does not). We also bought the Kiddopotomus Ray Shade and it works well with the Cortina. 2. The parent tray with cupholders and storage compartment. Before the baby was born, I didn’t think it would really be important, but I use it all the time! The storage compartment is great for a small hand sanitizer. 3. The basket is good sized for a diaper bag, purse, shopping, etc. 4. It seems comfortable for our little guy. The padding on the straps is a nice touch. 5. The padded grips are comfortable and it is super smooth to push. My husband actually wanted this over the Trevi because of the adjustable handles. He likes how high they go (he is 6 foot). I keep it in the middle setting (I am 5’7). 6. For the money, it really glides well and is sturdily built. It seems like a much more expensive stroller. It’s been a year since I bought it. I couldn’t remember what we paid, and after checking this site I was surprised. I thought we had spent much more for it, but they can’t have changed price that much in a year! 7. The snack tray opens on either side for easy loading and unloading of your baby. (It can also come completely off if you so choose). This is great when I am struggling to get my son in and he is protesting by putting his legs straight out and not wanting to get in. 1. It is huge. But so are all full-sized strollers. All those extras are going to take up space. We have a Toyota Corolla and we can still fit the Cortina plus all of our groceries into the trunk. 2. The breaks are hard to get “off.” Sometimes I have to use my hand if I am wearing flip-flops or don’t want to risk scuffing the top of my shoe. But, I don’t find that I use the breaks all that often. Maybe this is atypical? 3. When the seat is in the full recline position, my son’s head slides up and rests on the top lip of the back of the seat and he fusses. Therefore, I don’t put him in the flattest setting, but one click up from that. 4. Okay, I am really struggling to think of some more cons. Here is my last one: When you rest the stroller folded up and standing on concrete, the material on the basket gets scuffed. Ours had a small hole that is barely noticeable. Conversely, if you opt to lie it flat on the ground, the metal frame will get scratched. (My husband was lying it flat on the ground to fold it so he could do it one-handed and it scuffed). It really does take two hands to fold back up, but can be opened one-handed. But really, the stroller is going to get worn with use I guess, so it’s not too big of a deal. I read these reviews a lot when choosing my baby gear, so I hope that this helps you. We’ve been very happy with our decision to buy this stroller and feel that we have gotten our money’s worth. We have had this stroller for our baby girl since April 2008… and had no problems with it. It glides SOOOO smoothly and handles excellent. The adjustable handle is great. There is plenty of room in this stroller so it will definetely grow with our baby. She has loved it from day one of being in it, the back reclines so awake or sleeping she is happy… I have also used it to walk on rocky roads as well as in stores and it does both. I have had no problems with loud squeaky wheels, ripping material, or the material making my baby hot. She is like her daddy and is always warm pretty much so – so it was not the seat that made her hot. I have no problems with this stroller in stearing it either… I have on several occasions pushed this with one hand – no problem and I’m a clutz – and pulled a shopping cart at the same time while shopping. If I can do it – anyone can. And as for the seat that goes with this stroller not going in carts… I wouldn’t do that if it had the capability. Way to dangerous – that is a proven fact. I didn’t work this long and hard to have my baby to put my daughters well being at risk to make something more ‘convenient’ for me. I’ll either push and pull like I do, or as we do a lot, I’ll take my husband and while he pushes our little girl – I take the cart. Works out great that way. And if I don’t feel like pushing and pulling and my husband or a friend isn’t available – then the infant seat fits nicely into the MAIN part of the shopping cart and I have the top and the storage underneath to use. So I can still shop without putting my baby in a dangerous place. The storage basket is really nice sized but I admit it is not easy to access when the infant car seat is attached into this – by the way – LOVE the keyfit 30 seat that matches this! By far the best seat out there. The sunshade is small. But then again – I don’t know any kid that wants a shade so big that it covers their entire head and then they can’t see anything. So, I think that was done with a reason. All in all – I have absolutely NO REGRETS of purchasing this stroller. I would definetly do it again. I researched for MONTHS while pregnant trying to find the perfect stroller for a decent price, and I am extremely satisfied that I did. I would definetely recommend this stroller to anyone. The stroller is easy to fold and has a cup holder for me and the baby pluse a place for my keys and her pacifiers. Its also good to go shopping because of the basket in the bottom it holds all of my bags. Not so good its heavy and bulky, also the sun roof falls off all the time. Now i have to find a smaller stroller because this one doesn’t fit well in resturants or in small spaces you end up in the way of everyone and everything. Also when you close the stroller you have to make sure that the basket is empty because it closes facing out. love my chicco stroller system! the stroller is super easy to collapse and move compared to other brands. I’m only 5’5 and 120lbs and don’t find it heavy at all. I love the fact it’s water resistent. we’ve had a few diaper “blow outs”, spit-ups, and spilled drinks and it’s all cleaned up great! after 9mos of use, it still looks new and I can use it for the following children. I bought it after seeing my friend love hers, and I’ve had 2 friends buy it after using mine. I love the fact the stoller handle changes height since my husband and I like it at different levels. and it collapses small enough to fit into the trunk of my Jetta. I also love all the many levels that the back adjusts to, this was great while my son was learning to sit straight on his own. I was going to get a jogger, even though I don’t jog I just thought it would be easier to use, but I found them unsteady and loved the chicco better. would buy again! i have 3 strollers ranging in price and this is the cheaper of the three. it handles the best and i love that it lays almost totaly flat so my son can sleep. it folds up so easy and is half the weight of other strollers. i live in nyc and it is so easy to do potholes and uneven side walks. i love that it has the over the shoulder straps that many other strollers are missing. great for shopping the basket is huge compared to other stroller. my grandparents even love this stroller. two of my cousins got this stroller after walking my son and they have no complaints either. best stroller out there. I live in AZ which everywhere you turn there are rocks and sand. This stroller is great over non-smooth roads and pavement. It was so easy to put together. I LOVE the fact the handle is adjustable. Im 5’7 and hubby is 6’3. The basket is also a great pro. Its bigger then my other 2 strollers. This is a nice, sturdy, durable stroller. However, it is quite heavy and bulky. The basket is too small and hard to put stuff in and out of it. We love everything about this stroller. It is such a smooth ride and manuevers very easily. The handlebar is adjustable which is very convenient. The storage basket underneath is a great size and fits all of our bags when we go shopping. Our son loves this stroller as well, he is always happy as soon as we put him in there! It is somewhat heavy but what do you expect? All full size strollers are heavy and this one seems lighter than most others that I have tested. Overall, I think this is the best stroller and I am glad we made the choice to go with this one. Love It! It was easy to put together, is easy to use, works great with the car seat base, and looks great. It is durable and washable and has held up to allot of use. Well worth the price. I wish the basket was a little bigger on the bottom. It is hard to use if the car seat is in it since you have to lay the seat back, but that is a small complaint. Have only used it a few times, but rolls very smoothly, and love how the car seat so easily clicks in for a newborn. However, VERY heavy and bulky… takes up almost whole vehicle storage space. But love the way it looks and feels! My husband and I have had this stroller for 8 months now and love it. It is very easy to manuever and our son seems comfortable. The only problem I have with it is that it is hard to get a diaper bag in the bottom storage basket when the infant seat is attached to the stroller. Nice and sturdy. A little on the heavy side but very simple to open and close. THis is a great stroller. I have the car seat that clicks right into it for the travel system. It is very easy to use, it truly does open and close easily and it slides right into my trunk (I have a nissan sentra). The car seat easily attaches right on and my son loves his stroller rides as he loves to constantly move. I even put my godson in it one day at the mall and he is 2 and he fit in it great, and the straps work well. I like that the seat sits completely up for the 2 year old, and then he fell asleep so I was able to lay the seat all the way back so he could sleep lying down. Also, the leg rests clicks up to use with a smaller child to just lie in the stroller so they can’t slide out. This is a lightweight carriage that is easy to manuver and gives a smooth ride. My husband, son and I absolutely love it. I would recommend this to friends/family…great product! I looked for months for the perfect stroller for my son. I decided on the Chicco because of the high safety ratings (I have the car seat that matches this stroller). I was a little bummed on the color combination…I don’t think the grey matches the orange. However, “looks” aside, the stroller is so sturdy and VERY easy to fold up. It is a bit bulky-we have a newer model Saturn VUE-and it takes up most of the trunk area. However, I know that my son will be able to use this stroller for a long time. Well worth the money. We sold our peg perego to get this and are extremely happy with our choice!! This stroller is the easeiest when it comes to handeling, and my son is happier than pie to choose between his two cup holders! My hubby loves the adjustable handle and the “suspension” on the wheels. We hated our perego so much, that when my best friend was having to choose for her soon coming arrival, I sold her on the Chicco stroller. Only to turn around and buy a similar one myself!! It would be great if it folded a little smaller, but overall this is an awesome stroller! I was really happy with this stroller until my baby turned one. The shoulder supports are way too narrow and now my baby doesn’t fit in this stroller. I dont recommend this stroller to anyone! The snaps wont stay hooked, the canopy comes off and the waist straps barely fit around my sons waist. We are very very happy with this stroller. It is easy to fold up and unfold, it is not very heavy or cumbersome to get our of our trunk, it holds a lot of cargo (our large diaper bag, plus my wifes purse in the in storage area underneath, plus 3 cupholders and a keys/wallet storage area). This stroller is very easy to maneuver and easy to get our son in and our of. The only problem we have is with the straps, they can be hard to adjust and Chicco’s clips are kind of difficult sometimes, this is true with the high chair also. In the grand scheme it’s not a deal breaker though. I picked this stroller basically for asthetics. I really loved the bold orange color. Only later did I find out how safe it’s supposed to be. I would have loved a carriage style stroller, but really didn’t want to have to dish out so much money on it, only to buy a smaller one when the baby is older. The stroller is very easy to put together and fold down. It has a large basket, which can be difficult to access with the baby carrier on. But that is the case with most strollers. It has storage and cup space for both mom and baby. The handles adjust for different heights, very important if there is a huge size difference between parents, like with us. There are a few problems. The stroller is very large and doesn’t fold compactly. It is also pretty heavy, but that’s what makes it safe. I have also noted that it sometimes “bounces” slightly on uneven surfaces. Maybe that’s just mine. Also, the nylon material makes my son sweat when he’s sleeping. The canopy does fall off sometimes when I put in the carrier, but it really serves no purpose with the carrier and I might as well take it off altogether. I think the pros outweigh the negatives and am very pleased with my purchase. This is a no brainer stroller, easy to open and fold up. It fits in the back of my Jeep Liberty great, although then there is no room for anything else in the back, so I have to take it out when I need the space for large grocery orders. It is a little bulky, but I like having something sturdy and quality. I love it for walks and shopping, it’s easy to maneuver, adjust, and it’s quiet and smooth. The cup holders, key storage, etc are all great. I used it with the matching car seat, which I also highly recommend. I figured out that in order for the carseat to sit correctly in the stroller, I had to recline the stroller seat all the way down, so the basket underneath isn’t as roomy. But I sling my diaper bag on the handles, so I can fit my coat or purchases underneath with no problem. I originally liked the stroller for its color scheme, and checked out the online demo, which is great. Then I went to the store to give it a test drive and was sold. Try it out, it’ll probably convince you too. I love how easy it is to open and close. Great storage basket and cup holder. Easy to maneuver. This stroller is just – fine. Nothing special. It is big and a bit heavy and my biggest complaint is the sun visor. It never keeps the sun out well enough and we have to time our walks so we do not go out when it is too bright. Good basket and I like the removable tray. I like the stroller, but now that my son is 1, I’m finding the shoulder supports are too narrow and after loosening the straps as much as possible, it’s still a snug fit. So it was really good from 3 months to one year, but now I’m looking to purchase a new stroller which makes me not very happy with this stroller. way too big and bulky the basket strap broke off and the canopy keeps coming off… way to heavy and the wheels spin the wrong way when you are trying to walk……..staps are very tight around my 19moth olds waist so there is no way this will fit her till she is 3 ! This is such a great stroller (along with the car seat to make it a travel system). Very easy to set up, and I’m able to unfold and fold it in about two seconds. It maneuvers very well across rough terrain, as well as in tight spaces (very easy in grocery aisles!) and gives a smooth ride to my baby. The only thing that hasn’t been fantastic is that at first we were having trouble getting the car seat to latch in occasionally. We then realized that the seat back of the stroller must be fully reclined in order to latch the car seat, and when you do this, it’s very difficult to get anything into the storage basket underneath. Otherwise, we are very happy with it! It is a great stroller if your using the car seat in it or if your only planning on using it until your child hits about 20 lbs. The waist straps are too small. My son is 23 lbs and the straps are very tight on his waist. Then we were shopping and all of a sudden I look down and he’s screaming hanging from the tray, the plastic piece broke while he was squirming and he fell out of the seat. Thank God I wasn’t cruising through the mall I may have ran him over. Why buy a stroller if your just going to have to replace it in a year. Where can I buy new straps? Apparently no where. It’s rediculous. Don’t buy this stroller unless you have a very very very small baby and thing they’ll stay small. I loved the stroller until now, he only sat in the straps for 3 mos. It’s a great stroller and easy to open and close easy to manuever and the adjusting handle is fantastic being my husband is tall & I am not. Other than that unless they change the straps this year, I don’t know. The car seat is also fantastic. I love it, just buy a different stroller maybe. My son is 6 months old and so far we’ve only used this with the matching infant seat. It’s a good stroller. It’s easy to assemble and use, but it’s bulky. It takes up almost the entire trunk of my car. And with the infant seat installed, it’s not easy to access the storage basket underneath. I haven’t used it much yet because of that, but once we stop using the infant seat it’ll be nice. Using it for 13 months and still love it. Manovers like a dream even shopping. Adjustable height handle makes it comfortable for both my tall hubby and myself. Large basket, great cup holders, lots of room in the tray for the baby’s toys. Easy one handle release. Securly holds the carseat. My few complaints are that sometimes the wheels aren’t lined up properly so closing takes a couple tries. And adjusting the straps isn’t very intuative. But overall, I highly recommend it! I really like the look of the Chicco products. They are well made and durable, however – this stroller is very large and not very easy to close. Looking back, I wouldn’t have purchased such a large stroller as it is difficult to travel with, takes up a significant amount of room in our Toyota SUV. I would have purchased a stroller frame (i.e. Quinny) that accomordate an infant seat and then converts to a smaller stroller. My son is not a tremendous tot (he’s 50th% down the row), but now that he is pushing 10 months, he is outgrowing it. I’m sorry, but a baby that is 23lbs. should not be squished in a stroller designed for up to 3 years. It gets very crowded with winter clothing. We love this stroller and so do all of my friends that own one. My mother in law ordered this stroller for us after several of her friends and family told her it was great and it ranked very high on consumer reports. It was very easy to put together. My husband had no problems. In addition my husband learned how to work it in a matter of mins. I was very skeptical about purchasing the chicco stroller however after reading many reviews I was convinced that the stroller would be a great one….boy was I wrong. It is too big and heavy and I just hate when I try to open it. The only good thing is the basket which is big enough to put many things in it. Also, my son seems to enjoy the stroller very much. Overall, would not recommend stroller. We only had this stroller for two months! The buckle on the harness got stuck and never was able to unlatch it. My son is only 9 months and the harness was very snug on him. Not sure how this would accomadate him until he is 3. Squeaks a lot when moving. We have other Chicco products and love them. This was a miss. Poor quality. Takes up a lot of room in trunk. Positives-easy to fold up and large storage basket. This stroller is perfect for us! Folds up and opens easily, lightweight, maneuvers well, good for infants or larger kids . . . I love it! I am shocked at all the negative feedback… We have had NO problems out of this stroller… It was bought for my now 6 m old son… but my almost 4 year old (30 pounds) son fits and COMFY! I think it’s one of the lightest full size strollers out there. It’s a little on the big size… but the handle folds down making it super easy to fit into the trunk. VERY easy to maneuver and more than anything… FUN TO PUSH =) A MUST have in my book!! the hood can be put in the position you want from the very folded position into very down close to the tray, so that your baby is protected from the wind. The wheels can be fixed to go straight or to maneuver. It can be fully reclined, so that your baby can have a nice sleep outdoors, protected by the shields from the wind. The basket underneath is big! The tray is so useful for your little one to keep his/her toys or snacks and bottle. This stroller has been wonderful for the past 10 months since my daughter was born. She loves to sit in it, the storage compartments are excellent, smooth ride, easy to operate and assemble-just great all around. However, I am so disappointed now because my daughter has outgrown this stroller already. She is 22 lbs. so she is a little above average but there is no way this stroller would accomodate a 50 lb. toddler as the specs say it would. Now when she is in it she can hardly move her arms due to how narrow the shoulder area is in this stroller. To sum it up-this is a great stroller for infants but I wouldn’t plan on getting more than a year out of it. I have a special needs child and he uses this stroller more than most. This stroller has withheld all of the wear. The stroller is very easy to manveur. I love this stroller!!!! I’ve had this stroller for over a year now and purchased mainly for the look and because of how much weight capacity it could hold (my son was already 27 pounds by 9 months). It steers great, folds easily and so so so easy to take apart and put back together to wash. I love it!! And to be honest with you at one of the theme parks my 5 year old who is 65 pounds got tired and sat in it for a bit and it still steered well and easily. I loved the storage on this and it was nice when my son was 9 months old, but now I can’t even get him in without fear of pinching him with the harness. My first two sons used a peg perego which finally died after 6 years of hard use. I miss it and really should not have strayed from the brand. I’ve always been please with Chicco, but this was a big disappointment. I’m with everyone else…I wish I could find a way to return it and get my money back. I loved this stroller when my daughter was a newborn, but now that she is 9 months I hate it! The seat doesn’t sit straight up it is always a little reclined so she can’t reach the tray without stretching and pulling herself up! She can’t see out the sides unless she is leaning up and then she has nothing to rest her back on!!! My other child is 22 months and she barely fits in it because of the side support!!! She looks so uncomfortable because she is so crammed!!! Over all it’s not worth the money! This is a very nice stroller except for a few odd features. It is very comfortable for both the infant and parent, lots of storage, durable fabric, easy to clean… But a few things turned me off. There are “wings” on the back, they sit very close together. My son is only 7 months old and his shoulders barely fit between them. The back also does not come completely upright, so for a child who wants to sit up, there is no support behind them. One more odd thing, a number of times the wheel locks spontaneously fell into place and had to be undone in order to steer the stroller. This stroller was excellent when used as a travel system, except the stroller is HUGE! It takes up a lot of room in the trunk. However, it has excellent storage underneath if you are shopping. My daughter is now 13 months so can sit up comfortably and pull herself forward when she wants to see. When she was 6-9 months, the stroller does not allow the baby to sit upright and she did not like that. Now she is bigger it is fine! I use the chicco cortina stoller in stores and out on the road. It is easy to push around with the car seat attached. The basket at the bottom fits my diaper bag and a few other items. I love how the handle adjusts to different heights depending on who is pushing it. I have been using this stroller exclusively for my child since birth. He is now 12 months, 30 inches, 23 pounds. I also have a Keyfit 30 carseat which I bought separately. Very smooth and not wobbly- even one handed. Folding mechanism is strong and not likely to break-but not really one handed if stowing in a car since you have to put the handle bar down first. Fits in a small vehicle -Saturn SL2 and a Pontiac Vibe. Material wipes clean very easily and wears well. Fits through security check at airport. Basket is huge and holds a ton – can even fit base in it (which I did at the airport). Adjustable handle height is perfect. Fit the Keyfit 30 car seat, but when my baby was 7 pounds and newborn, he fit well without the car seat as well when fully reclined. The material is not very airy. It is of manageable weight, but definetly not lightweight. We are going to buy a lightweight stroller soon for travel. I would recommend the stroller to a person who has the Keyfit 30 car seat. If you don’t, buy a car seat carrier and a lightweight stroller you can use once your kid has outgrown the car seat carriet. I would have done this, but really wanted the safest seat available. This stroller has been used for 2 of my 3 boys. We use it for going to the mall, zoo, walks and other things where my kid will need to be in a stroller for a longer period of time. I use a umbrella stroller for short trips. `I had mold grow on the stroller fabric (snow got in the trunk and I didn’t notice it and the stroller was left in there for a few days)—Chicco was awesome and sent me all new fabric free of charge! We have a one month old son and have been very happy with this stroller. Easy to open and close. Also, the adjustable handle is great. No issues with the size. I bought this stroller last night at the store, and put it together this morning. My child is 6 months old and weighs 17 pounds. He barely fits within the harness system, as it is so tight. The stroller does not allow the harness system to be adjusted much. The product says the stroller is good up to 50 pounds. There is NO way this stroller would fit a 25-30 pound baby. I will try to return it today. Hopefully, they will take it back. I have been using this stroller since by baby was born and she’s now almost 7 months old (~15 lbs). It works great with the Chicco car seat as a travel system, or as a stand-alone stroller. It’s so easy to fold, and manuevers great. The sun shade is pretty large, and also tips forward so it’s easy to keep the sun off of the baby. The basket underneath is a good size. I have an Acura TSX, and it fits in my trunk quite well. We recently used it at the airport too, and it was awesome. It went through the x-ray at security just fine, and we had no problems gate checking it. The 5-point harness is the only thing that could use some tweaking in my opinion. The shoulder straps didn’t adjust as small as I’d like, so we just didn’t use them. And the clip to unhook the harness doesn’t release as easy as I’d like, but maybe they did that on purpose as a safety feature. I also like that the back of the seat reclines so the baby can sleep. Overall, I love this stroller and should be able to use it for a long time. We were very unhappy with this product! It is hard to fold, when the infant seat is in the stroller you can not get to the basket, and my infant seat got stuck in the stroller! I had to pry my sons seat out of the stroller! I was so unhappy I went and returned my stroller and bought a different brand that would hold my Chicco carseat! The only thing i liked was that it matched my carseat! Love the adjustable handles… great for tall women. Like that the seat reclines completley flat. Snack tray is easy to remove for cleaning…great for infants to toddlers. Its big and bulky but I wouldnt trade it for less comfort for my granddaughters…easy to fold and put in the trunk. I have been using this stroller exclusively for my child since birth. He is now 17 months, 30 inches, 22 pounds. I also have a Keyfit 30 carseat which I bought separately however i love that they match. Folding mechanism is strong and not likely to break-but not really one handed if stowing in a car since you have to put the handle bar down first. I love the fact that the stroller folds UP to you so you do not have to bend down to pick it up. When the product was new I did have some issues with folding the unit however i have since learned that I was not pulling the lever all the way up. Fits in a small vehicle – Focus SVT 2 door with hatch. Padded well allowing for a comfort and enjoyable ride. Fits through security check at airport. BIG concern since we do travel. Most all airports will make you fold the unit and place thru the x ray machines. As long as the wheels are folder IN it will fit thru the machines avoiding a manual search which takes up a lot more time. Basket is big and holds a lot- however i would like to see it larger. It can even fit base in it (which I did at the airport). when the seat is fully recline it is hard to place stuff under there however it will fit under there. Adjustable handle height is perfect. you can rotate the handles in to several heights. It is of manageable weight, but definitely not lightweight. For that we got the smaller umbrella one WHICH I do not recommend as the wheel base is very narrow causing me to trip over the wheels all the time. which is why this one is my primary one and i love it. It reclines totally flat, but doesn’t sit upright 100% so it was difficult for my son to reach snack tray until he was older. Stapes do not get really tight. My son is 17 months and 21 lbs maybe 22lbs and the waist and shoulder straps do not get really tight around him however i still feel pretty good about his safety as it would take alot for him to get out of the seat and belts. I love this stroller. It is very easy to open and fold. It also has a conventient place to put keys and a cell phone. I just wish it had two cupholders. The basket is huge. You can fit tons of stuff in it. I definitely recommend this stroller. We found this stroller to be wonderful in the store. It had a great 3 position leg rest (the one in which we enjoyed most was flat out). Unfortunately we tested only the orange and grey one in the store but came home with the silver cubes design. Upon unpacking and fully assembling the stroller the leg rest can only be up or down. My husband ran back to the store and found that only the orange one seemed to have this feature (on the floor model) so we traded it out for the orange one. Upon bringing it home we discoevered the same issue, so once again we will be returning it, this time just to get our money back. Very Disappointed, considering this was the only stroller that could accomodate our long legged 2 year old.